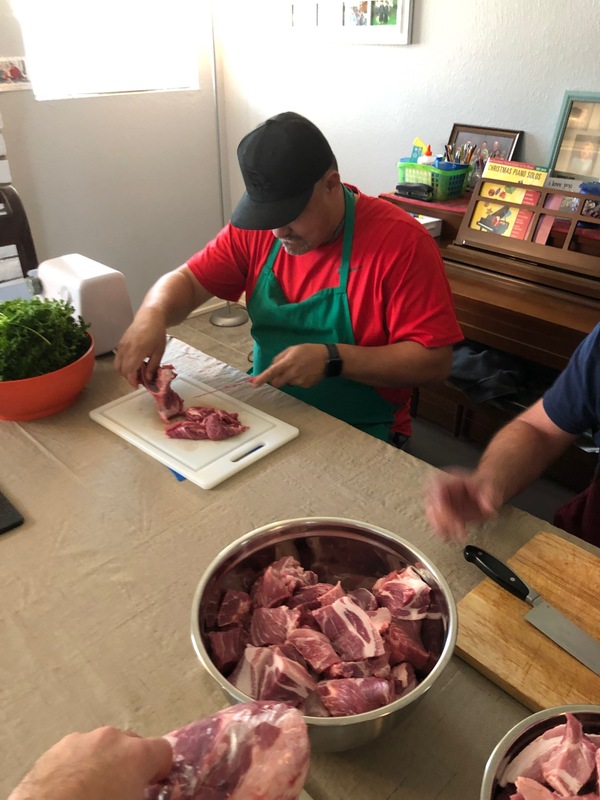 Last weekend, while I was out at the toddler cooking class I teach once a month, my husband got together with a group of guys for a Sausage Festival. I’m not being gross. 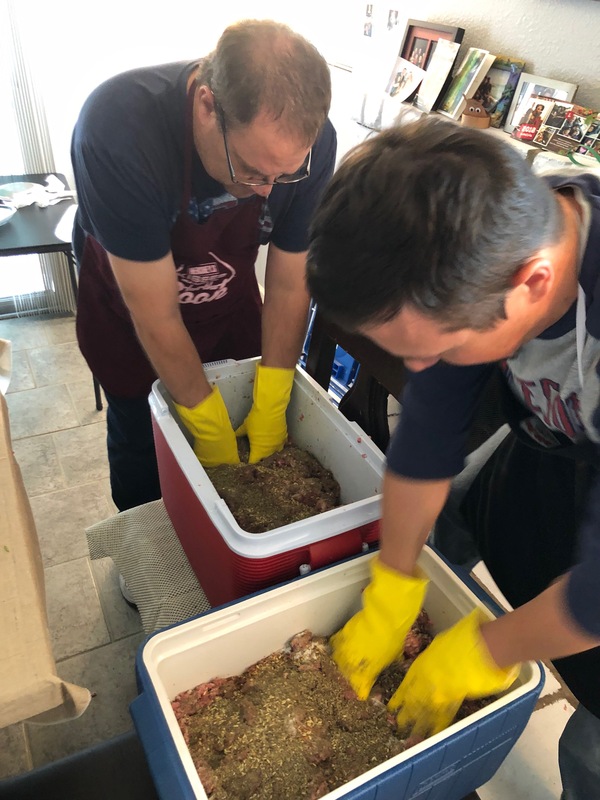 They literally hung out for several hours making sausage. I kinda wish I could have been there, because this is one aspect of food production I have never personally experienced…and, though it’s not terribly glamorous, it’s pretty interesting! 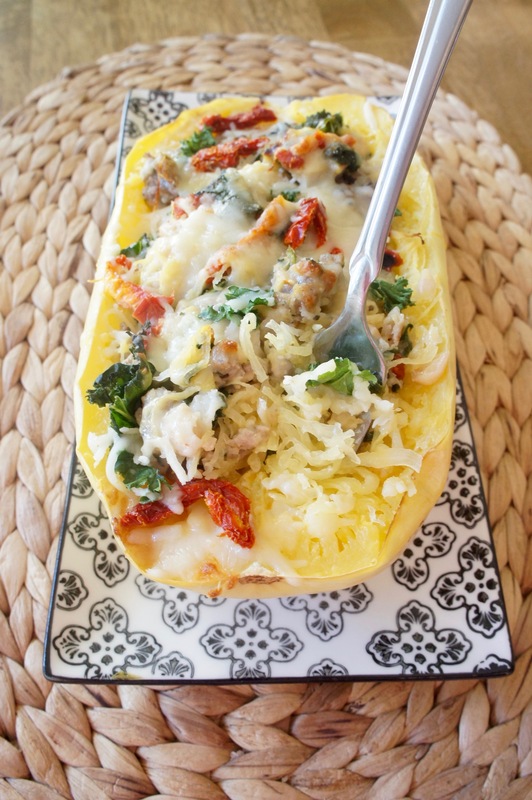 So before I dive into this tasty Twice-Baked Spaghetti Squash with Sausage and Kale–which, of course, uses the sausage from the Sausage Festival–here’s a little glimpse into the process. Apparently it all starts with pork shoulder, cut into chunks. And gets mixed with a blend of spices–in this case, parsley, garlic, fennel, and red pepper flakes. And finally, the part everyone knows and loves: filling the casings with the meat to make links! As far as I’m concerned, the best part about the Sausage Festival is that we now have homemade sausage to last until Kingdom Come. 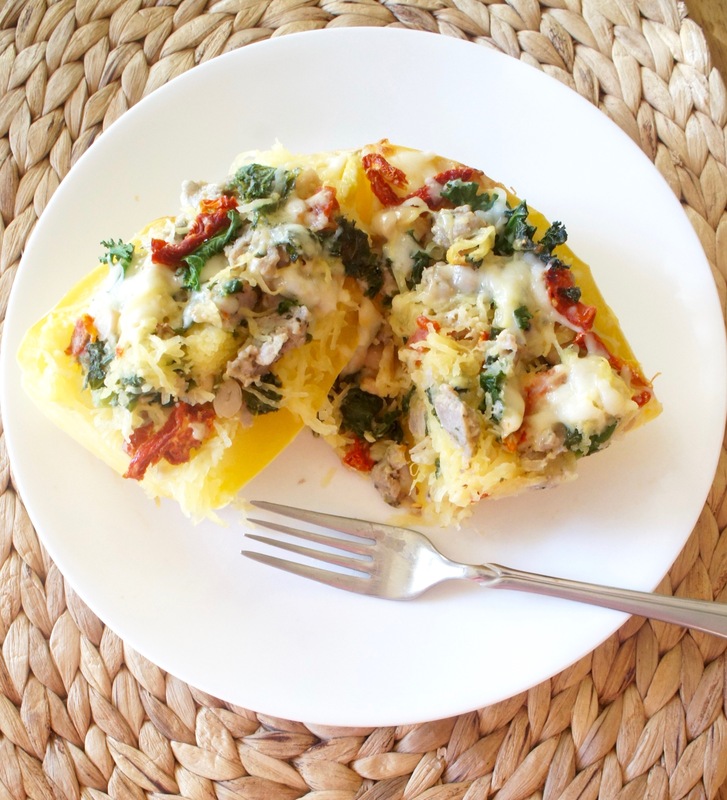 The guys made both links and bulk sausage, so I was only too happy to use some of the bulk kind up in this hearty, Mediterranean-style Twice-Baked Spaghetti Squash. It all starts with yourr basic giant yellow squash, baked and scraped to get those signature squiggly strings so reminiscent of pasta. In the meantime, you’ll brown some sausage and wilt some kale in a bit of garlic-infused olive oil on the stovetop. Toss these yummy goodies–plus some sun-dried tomatoes, parmesan, and cannellini beans–with the squash strings. Refill the shells, top with a sprinkle of mozzarella, and bake one more time for the finished product! 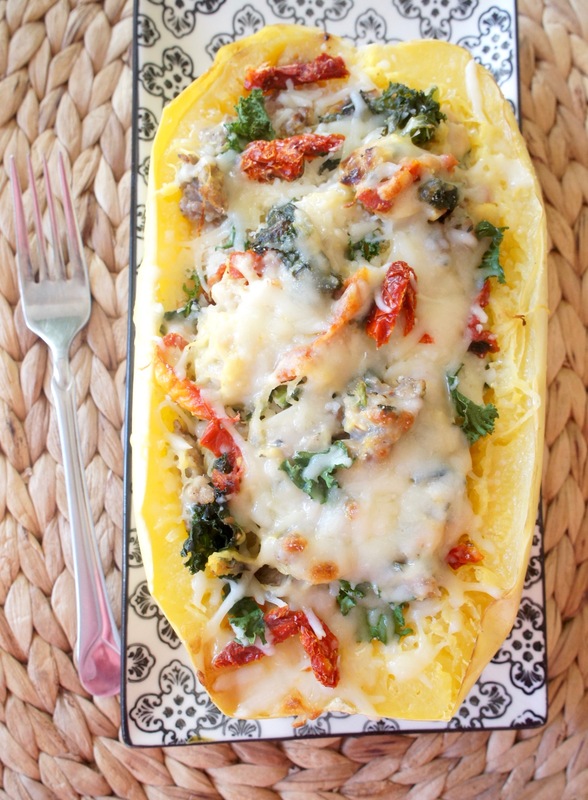 As a one-dish meal, this Twice-Baked Spaghetti Squash is full of nutrients from the kale, beans, tomatoes, and squash, makes a ton, and reheats well. I think you’ll enjoy it, even if you don’t have the luxury of homemade sausage. A hearty, mostly veggie dinner with flavors of the Mediterranean. Leave off the sausage for a vegetarian version! Preheat oven to 400 degrees. 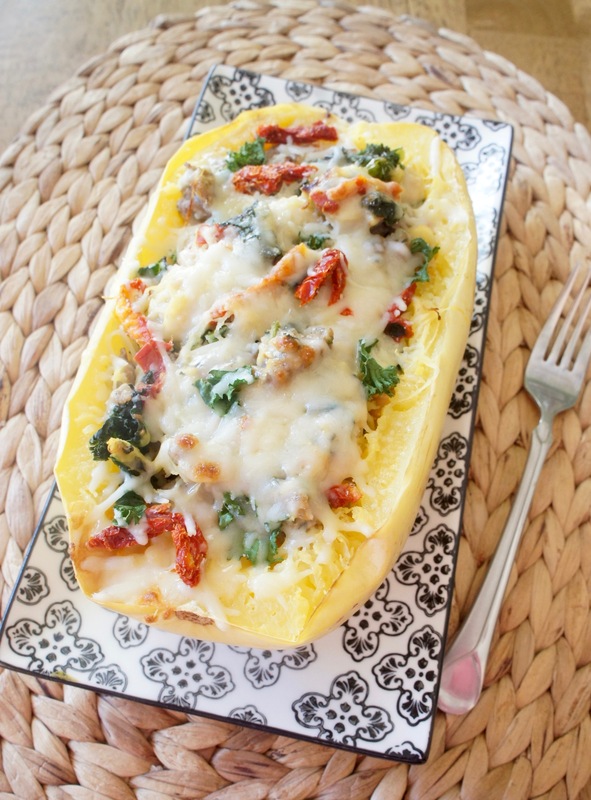 Prick both spaghetti squash all over with a fork and microwave each one for about a minute, to soften. Slice squash in half lengthwise and scrape out seeds. Place squash halves cut side down on a greased baking sheet. Bake in preheated oven for about 35-40 minutes. While squash bakes, prepare the rest of the filling. In a large pan, cook the sausage over medium heat until browned and crumbled. Remove from the pan and place on paper-towel lined plate. Using the grease left behind by the sausage (or supplementing with olive oil), saute garlic and kale until kale begins to wild and garlic begins to brown. Season with salt and pepper, to taste. Add cannellini beans, sun-dried tomatoes, and parmesan and cook an additional minute or two. Place mixture in a large mixing bowl, along with cooked sausage. When squash has finished baking, remove from oven and scrape most of their contents into the mixing bowl, leaving a small border of flesh. (Be careful, squash will be hot!) Mix squash strings, sausage, and kale mixture thoroughly. Divide the mixture among the four squash halves and sprinkle with mozzarella. Place back on the baking sheet and return to the oven for an additional 10 minutes, or until cheese has melted and filling is warmed through. One serving equals half of a squash boat.